Today’s comic is from June 10, 1971. 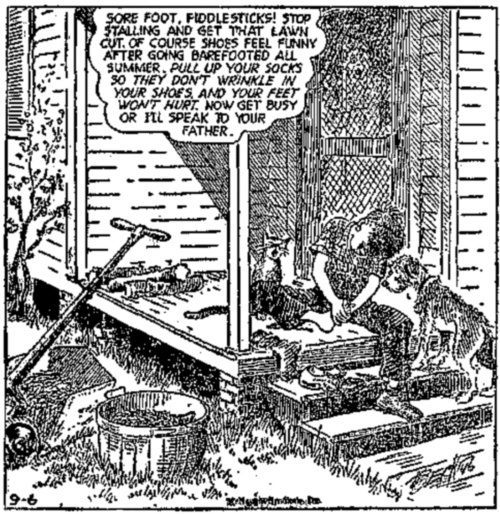 It’s from Muggs and Skeeter, drawn by Wally Bishop. Around here school started back up on Wednesday. Way back when, that would have meant complaints from wearing shoes again after having gone barefoot all summer long. 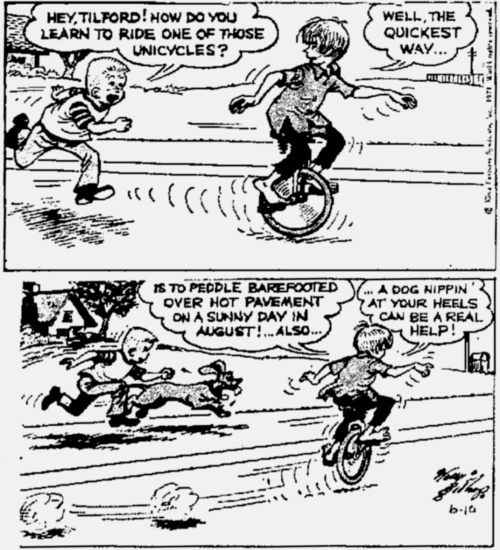 Here’s a comic from September 6, 1946. It’s from “All in a Lifetime” by Beck. Just some thoughts: it looks like his mother let him mow the lawn all summer lawn barefoot if it’s only now that he’s complaning—I guess that wasn’t considered too dangerous. Also, I’ve never heard that wrinkled sock excuse used in tandem with stuffing feet into shoes that are probably too small. And finally, just think about how common it was to force kids into doing something that hurt so much, just to conform. Frank and Ernest is a comic strip thats pretty much an excuse to draw bad puns. This one, from this past July 12, is no exception. It was started by Bob Thaves but is now done by his son, Tom. It’s not specifically barefoot-related, but it’s close enough (and I like it).